AT MAX; The Ultimate All Terrain Detector, Maximum Performance, Wireless Convience! 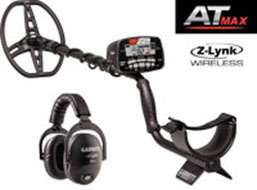 This is Garretts most powerful All Terrain VLF detector – ideal for coin shooting, relic hunting and more. Maximum Detection Depth: Increased transmit power, enhanced electronics, and a 13.6 kHz operating frequency allows the user to detect a wide range of targets-from Gold nuggets and jewelry to large coins– deeper then other Garrett AT Detectors. Advanced Ground Balance Options: Automatic and manually adjustable for improved performance.175 points of hi resolution Ground Balance allows the AT MAX to handle both conductive soils (such as saltwater beaches) and highly mineralized ground. All Terrain Versatility: Weatherproof design for dusty, humid, or wet environments; Fully submersible to 10-foot depths. Foe underwater use , optional waterproff wired headphones must be used.